This webpage is about my ARTSAT2:DESPATCH Spacecraft receive experiments on 437MHz. The Shin-en2 and ARTSAT2:DESPATCH spacecrafts transmitting in the 70cm amateur radio band are launched on 2014-12-03 together with the Hayabusa 2 and are cruising into deep space. 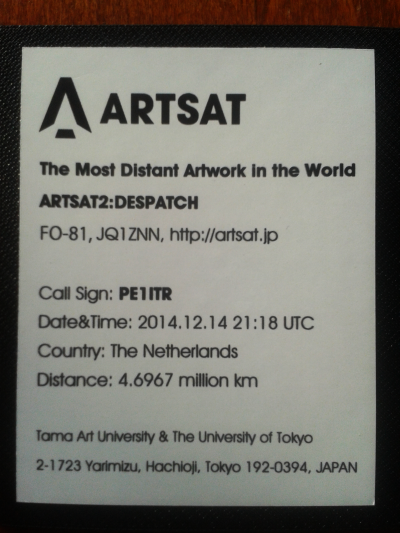 Until now I could detect the ARTSAT2:DESPATCH beacon at a distance of 4.7 million kilometers from earth. The shin-en2 reception is reported on this page. 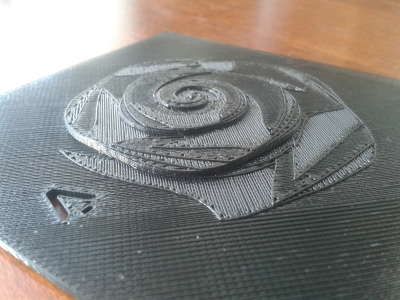 ARTSAT2:DESPATCH: CW Downlink 437.325MHz. 7w A1A Modulation. This beacon is not continuous active and has a transmission schedule! Seeartsat webpage for schedule. 4x16 element DK7ZB Yagi 3m AGL or 4x16 element DL6WU/Flexa Yagi 10m AGL, 0.35db pre-amp, Funcubedongle Pro+. Related report of reception 2005-09-22 Mars Reconnaissance Orbiter on 437.100MHz. Signal Reception 2014-12-14 21:06UTC. 4.7million kilometers distance!! I think the signal is within the white rectangle. It is very very weak and it could be doubtful whether this is the signal. But I think it is the signal because it starts at the exact time of the periodic transmissions, the negative Doppler shift correlates with the expected values and the duration of the transmission is consistent with what I've seen on 2014-12-08.